A simple and cute combination of pastel spring flowers manicure! 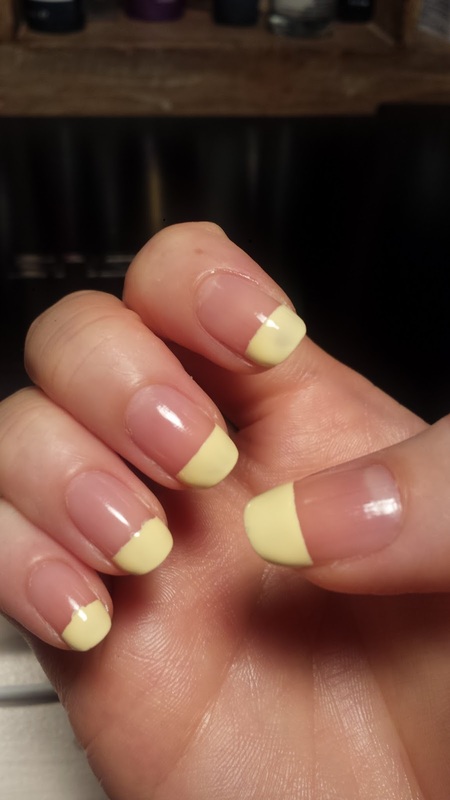 After applying base coat, I used normal stationery tape as a straight edge to make the yellow french tips. 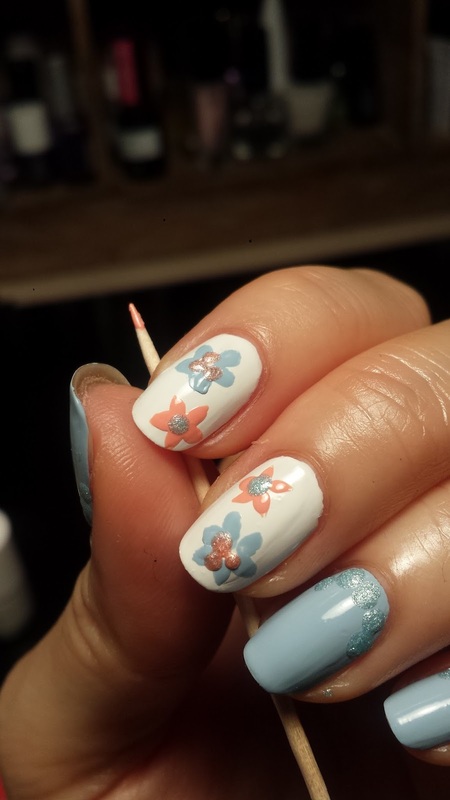 You could also free hand this because the flowers would be covering the line anyway, therefore it doesn't have to be perfect! 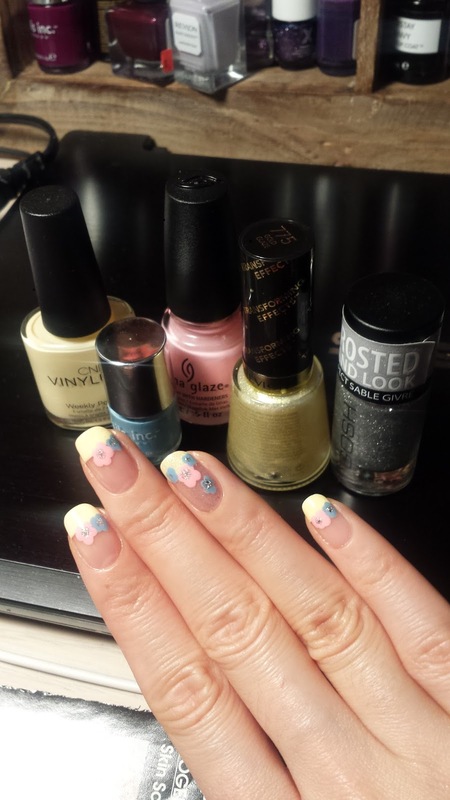 Click HERE for more tips and tricks for using tape and nailart tape! 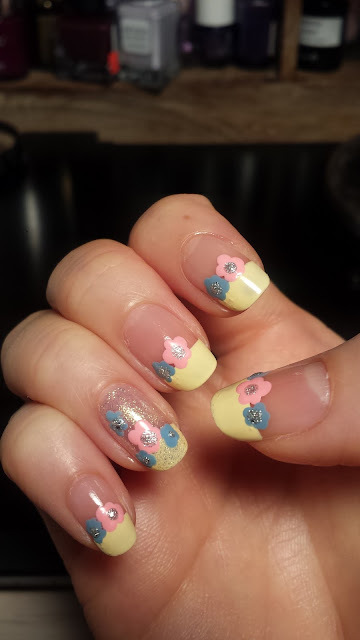 I then used my dotting tools to paint the pink and blue flowers in different sizes along the seam of the yellow french tips. 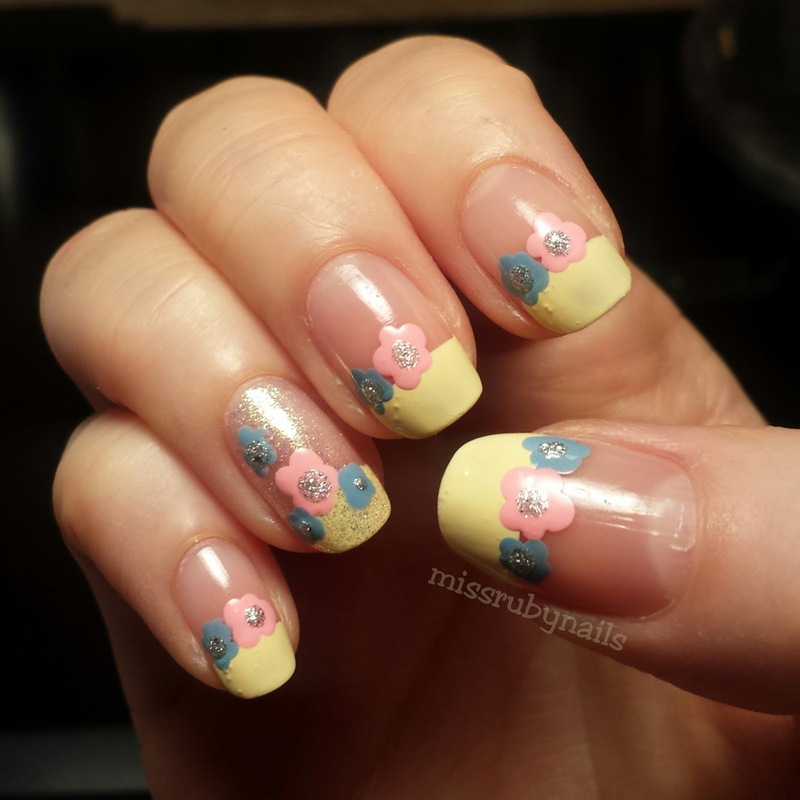 I added a few more little flowers on the fourth finger as an accent. A silver dot was painted in the center of each flower. 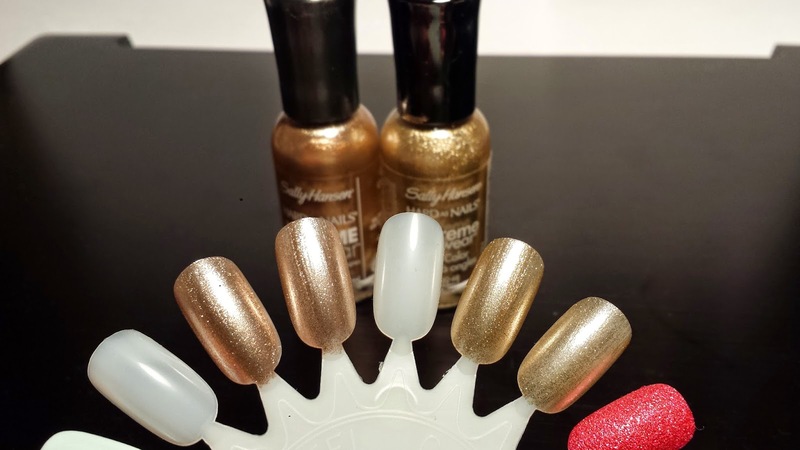 On the fourth finger, I added a fine gold glitter top coat to finish it off. After applying top coat and we are done! Simple and cute right? 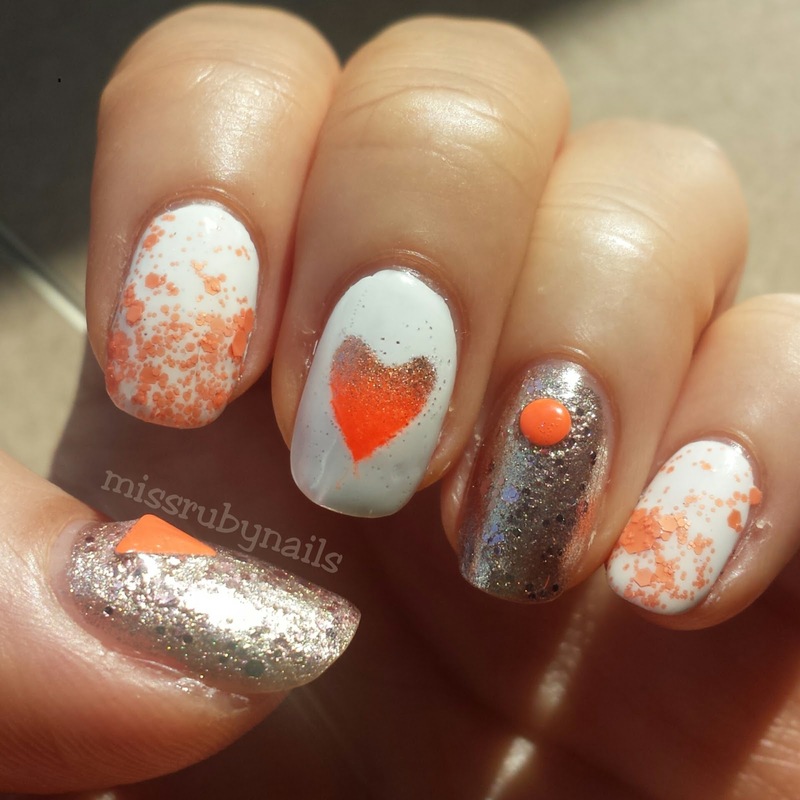 This is a bright orange/white/gold manicure that was super fun to do! 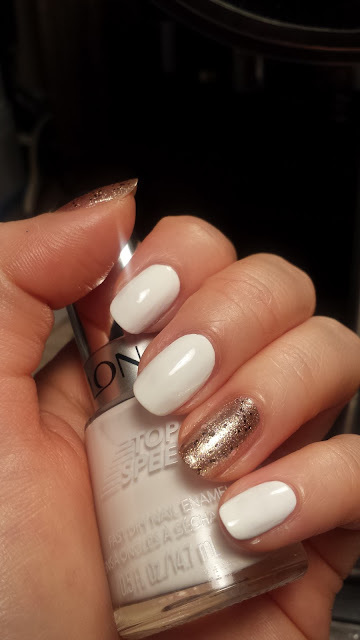 I started with plain white polish, and gold glittery polish on the thumb and fourth finger. 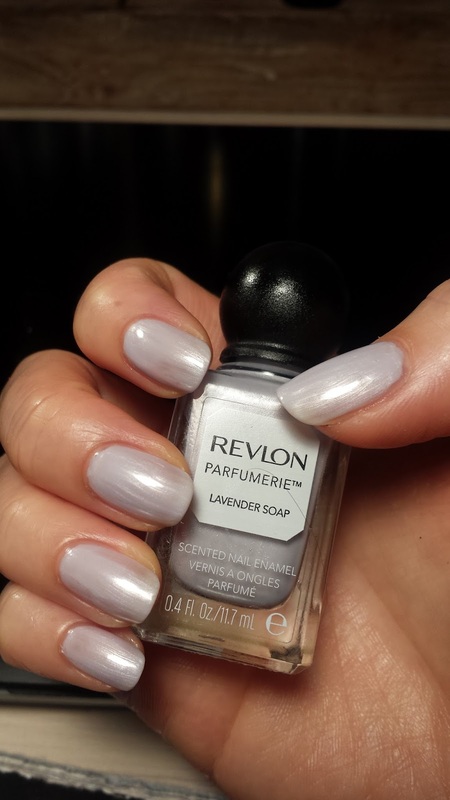 This white polish was by Revlon and it is from the Top Speed line but I did not notice a quicker than normal drying time. 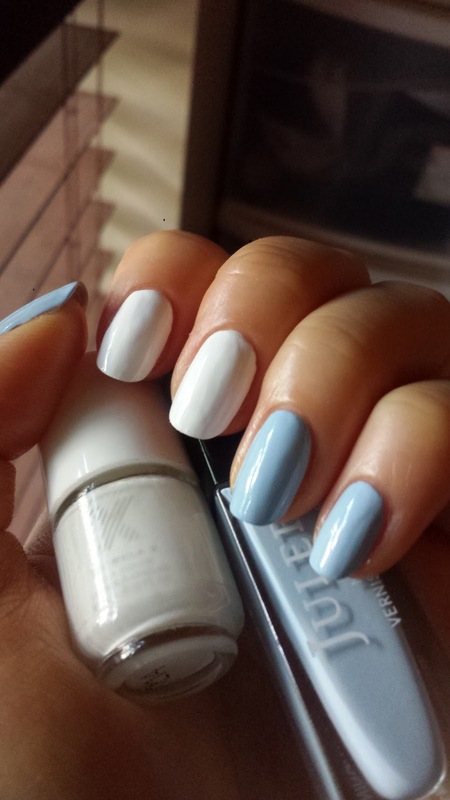 However, it is still a nice creamy polish that's opaque in 2 coats! For making a perfect heart shape, I folded a piece of tape in half and cut the heart out by cutting one side of the heart, so when I unfolded the tape I got a perfectly symmetrical heart! Then I put the tape over the middle finger and sponged on the gradient of orange and gold polishes. 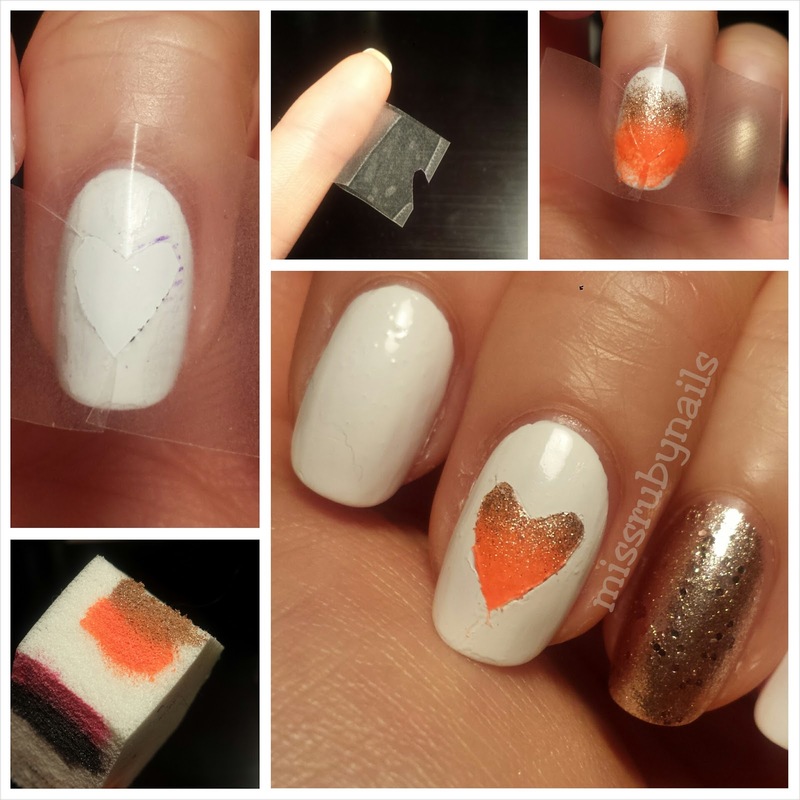 A tip for using any tape for nail art is to stick the tape onto your skin at the beginning to make the tape less sticky So when you are pulling the tape off the nail after your nail art, the tape will not destroy the base polish. It could pick up the pick polish if the tape was too sticky. 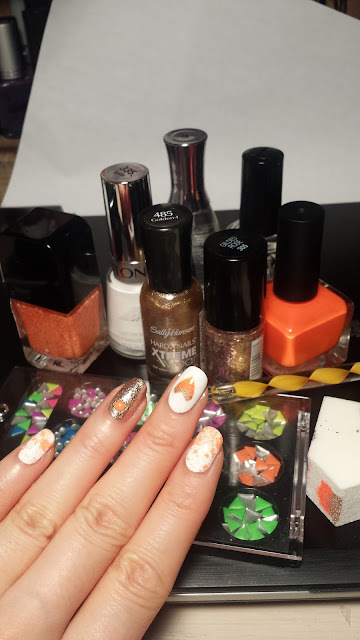 On the other white nails, I added some orange chunky glitter to match the orange theme. I also added some neon orange jewels onto the gold nails! 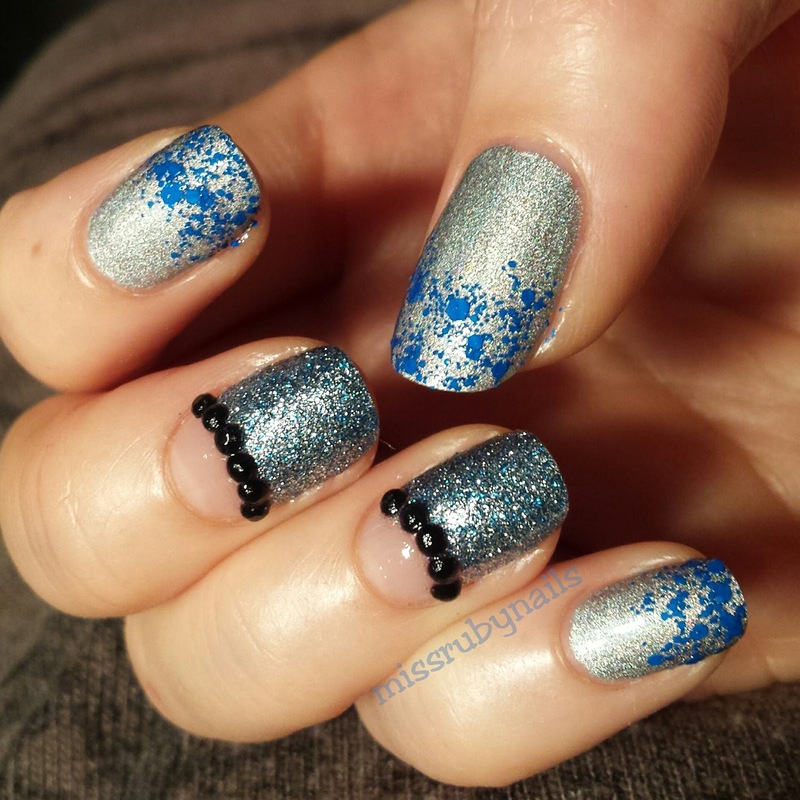 Here's a silver and blue holographic and sparkly glitter manicure for anyone who's feeling fancy! 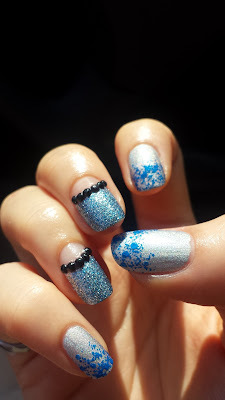 On the middle and fourth finger, I used a metallic blue and silver fine glitter polish by Sephora Formula X and left a bare section near the back cuticle area. Then I lined the seam with some black jewels in a curve. 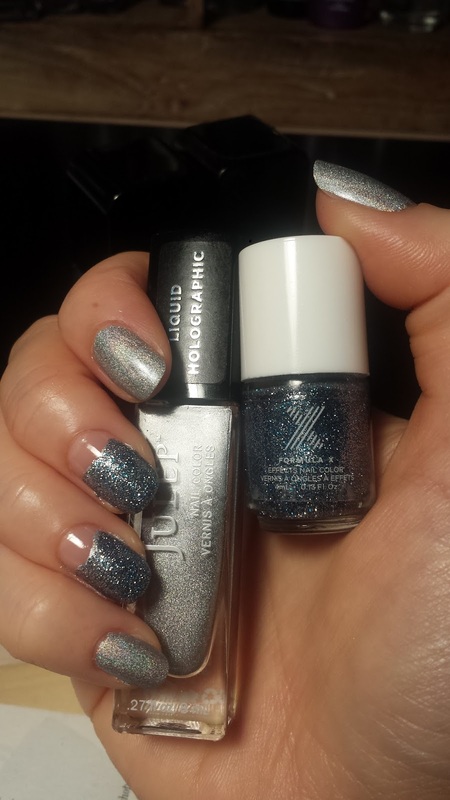 The silver holographic polish is by Julep. It is a gorgeous linear holo with super fine glitter but it does not wear good on the nails. Click HERE for a more in depth review of the polish. This polish will chip FAST, it will start chipping around your second day of wearing. 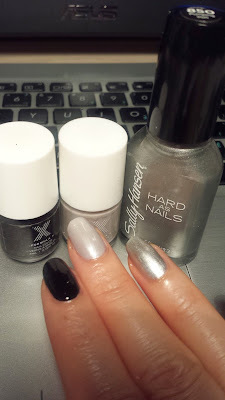 But it is still a very nice holographic silver polish that you can't stop looking at your nails, especially under the sun. The photo on the left above was under indoor lighting and the photo on the right was under the sunshine. 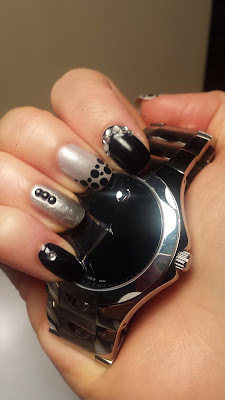 It is quite hard to capture the holographic effects on camera from the silver polish. 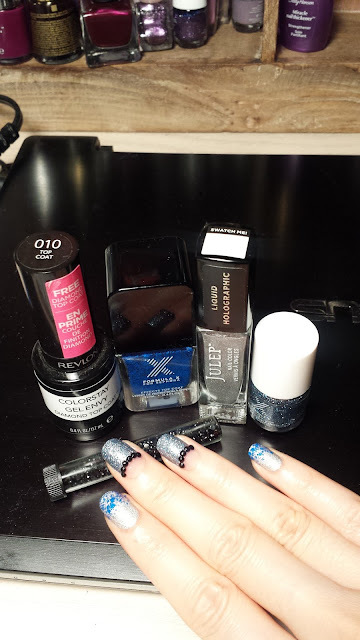 I also topped the silver nails with some chunky blue glitter and we are done! 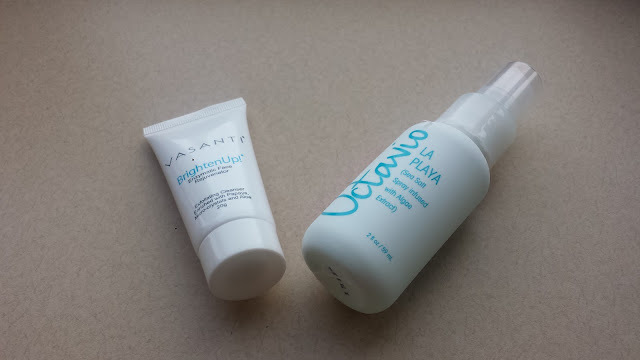 There are 10 benefits listed on the bottle of this hair treatment spray which sounds too good to be true! 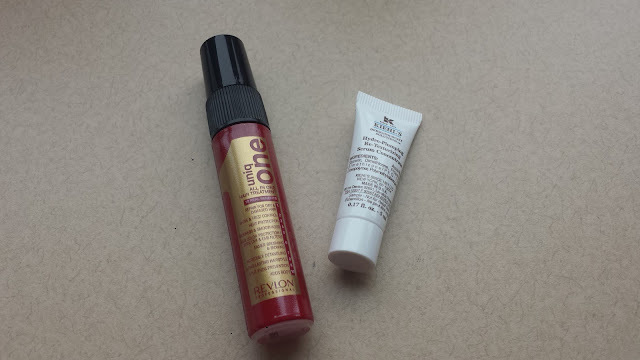 But I love me some leave in hair treatment spray and will definitely put this to good use. This sprays out as a thick white paste so I recommend spraying onto the palm and rubbing them together then apply to the hair. It has a strong hair conditioner smell too which I think is quite nice. 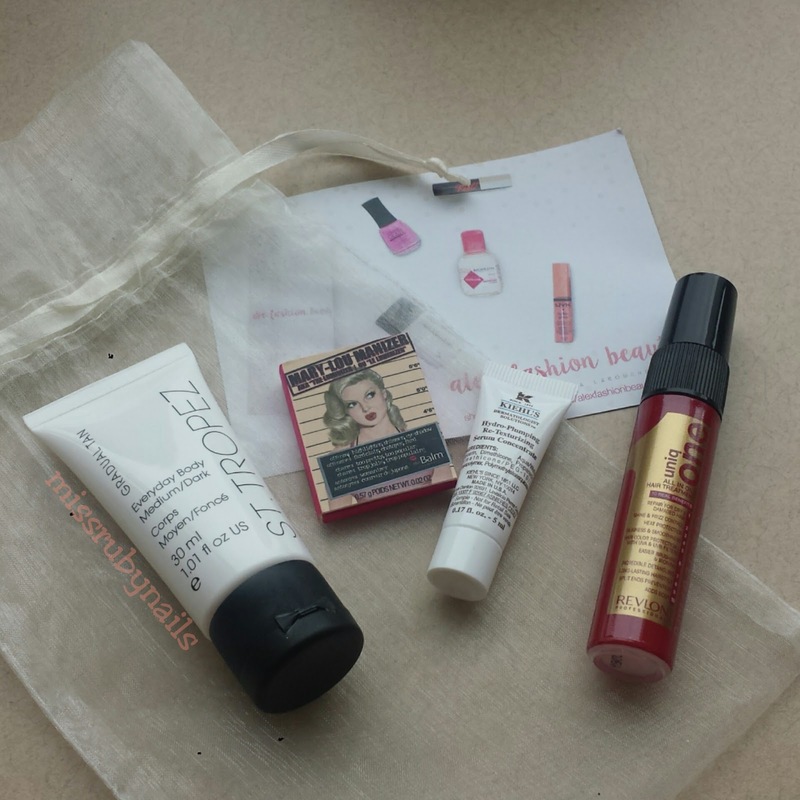 I know that Kiehl's skincare is superb and I am happy to get to try one of their serums! This serum is formulated with 15% plant-based glycerin and shiso leaf extract. 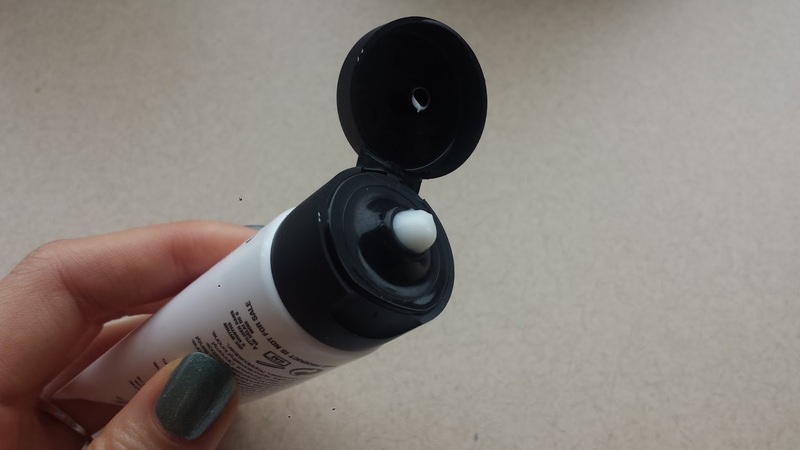 There is no fragrance to this serum. Let's see how this perform. 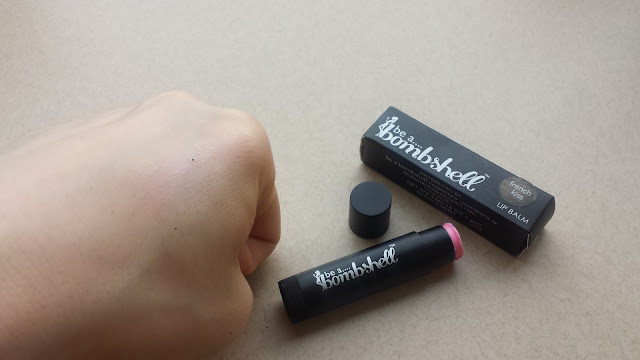 I own and love this product already as a highlighter lover! This is a golden/honey shade of highlight with intense sheen but no big visible glitter, which is my kind of highlighter! Although I already own the full size, this is still the item in this month's box that got me the most excited! 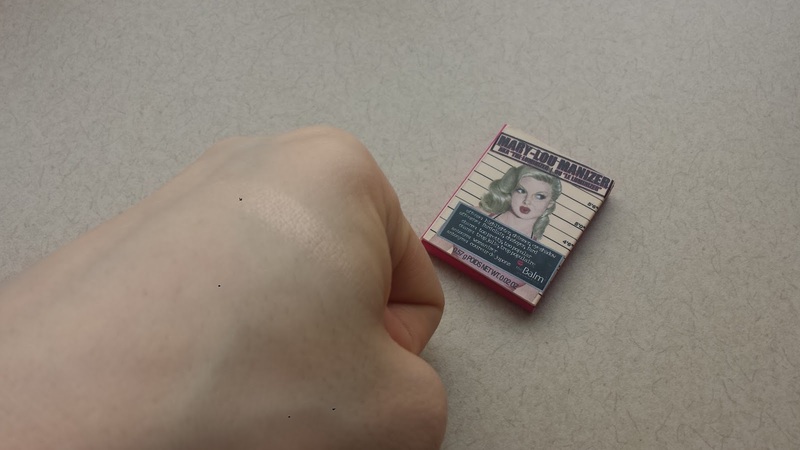 I have always wanted a mini size highlighter at my work and for my purse! It seems like I have be seeing this brand quite often lately in my subscription boxes. 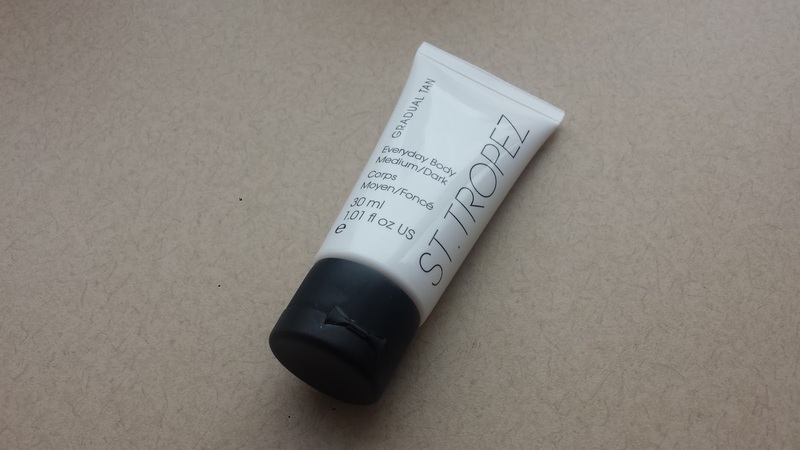 Surprisingly this self tan lotion smell REALLY nice from the tube. I think all self tanning brands are trying to avoid that unpleasant scent altogether now! 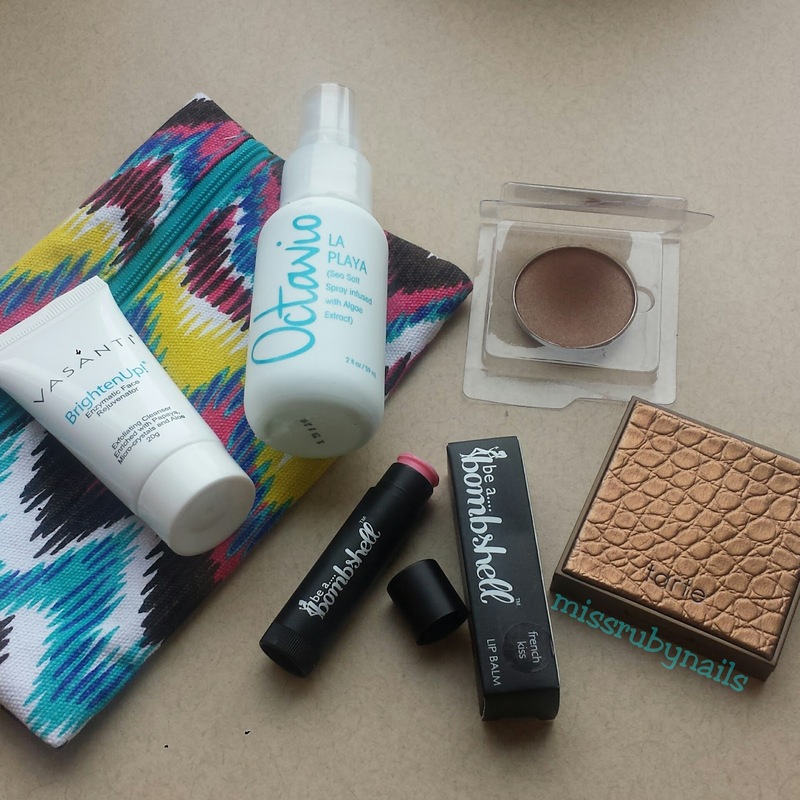 I will need start using these self tans more now that I have accumulated a few in my stash. 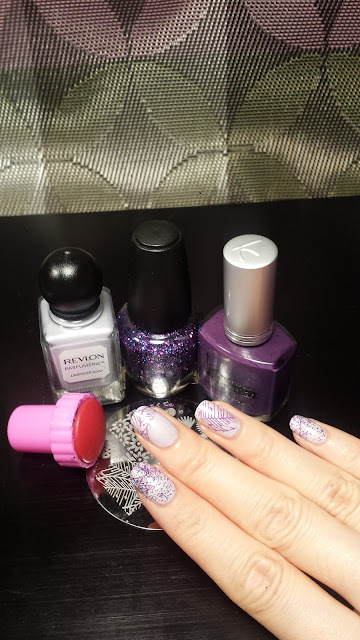 I have a quick lavender stamping manicure here with the Revlon Parfumerie polish in Lavender Soap. This polish really does smell like lavender soap (reminds me a bit of the Johnson's baby shampoo + a little lavender scent). The scent lingers around for days if I put my fingers close to my nose and sniff!! 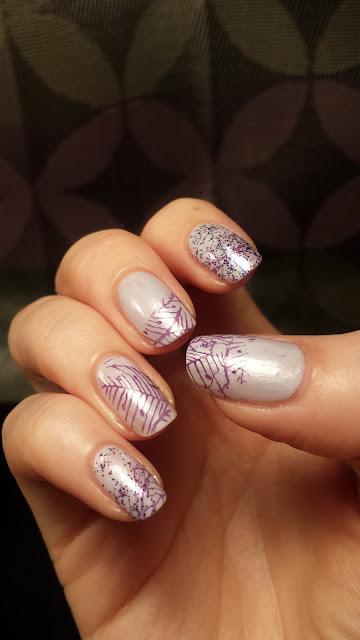 After 2 coats of this lilac lavender color, I added some leaves stamping using a darker purple solid shade and then topped some of them with glitter. 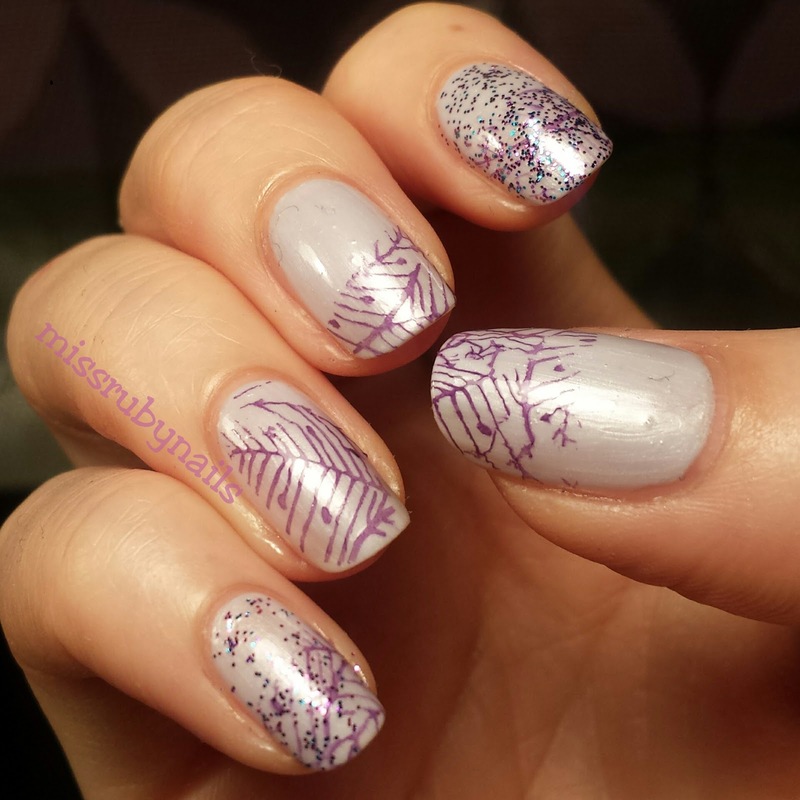 Click HERE for tips and trick for stamping! 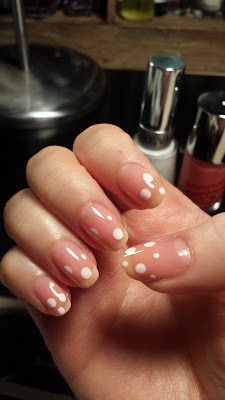 I think I was quite late on trying this pond dotticure since I didn't think I have a good jelly polish. 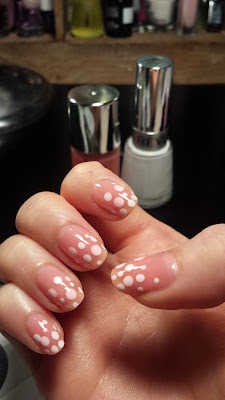 However, I found this really sheer polish I got years ago that I seldom use (because it's TOO sheer!) and thought it made a good ponding manicure!! 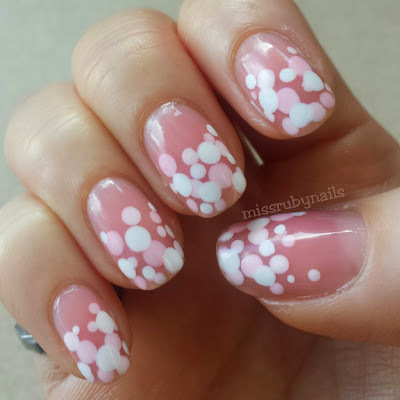 After a layer of base coat, I put a few white dots in different sizes on the nail, waited for this to dry and then added a layer of the sheer pink. Then I basically repeated this step until I was happy with the result. This took a bit longer than a normal manicure of course due to all the layering. 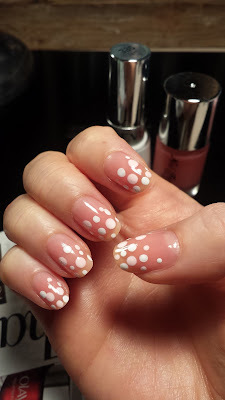 I repeated the layering for 3 times, with dotting white polka dots on top of the last pink layer again, so one can see the most white color of dots. So it was "Dots, jelly, dots, jelly, dots, jelly, dots" and inserting "wait" in between each... haha. 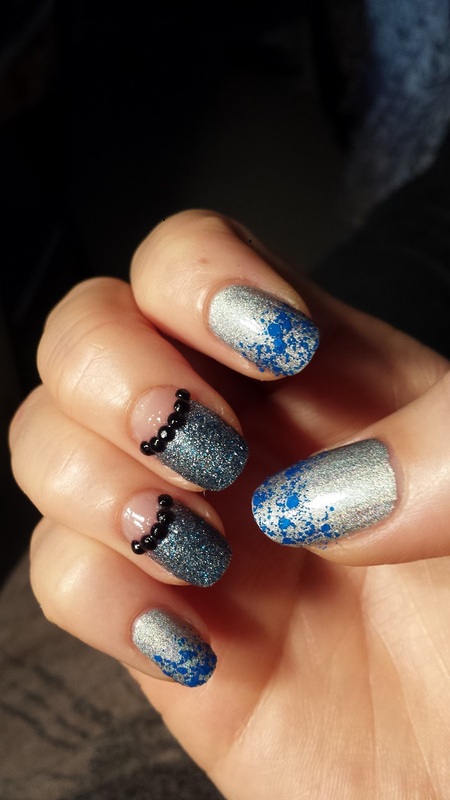 At the end, a good QUICK DRY top coat would help a lot since all the layering would give a thick total polish stack. 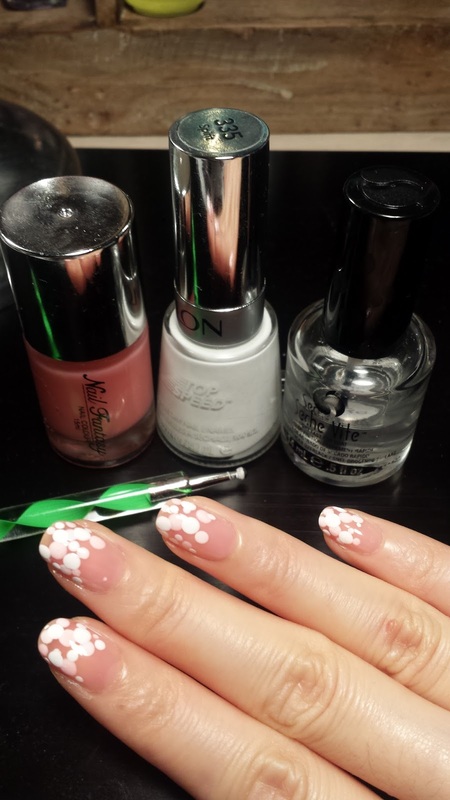 I used Seche Vite here. 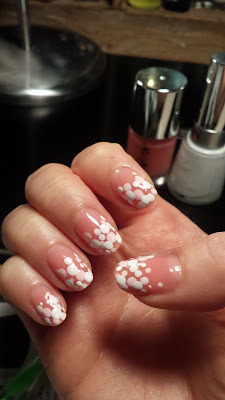 I will keep looking for jelly/sheer polish from my collection and see if I can do this again! It was fun! 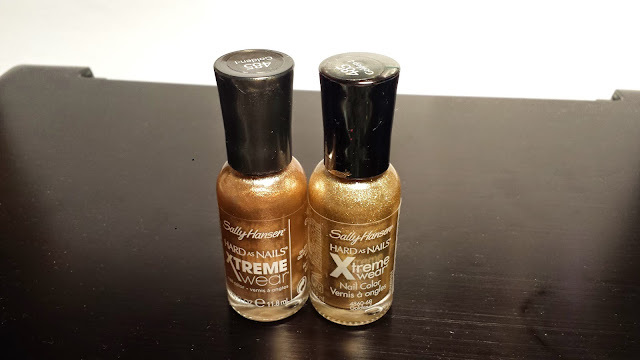 I own the Sally Hansen 485 Golden-I for a few years now and it has been the go-to gold nail polish for me. 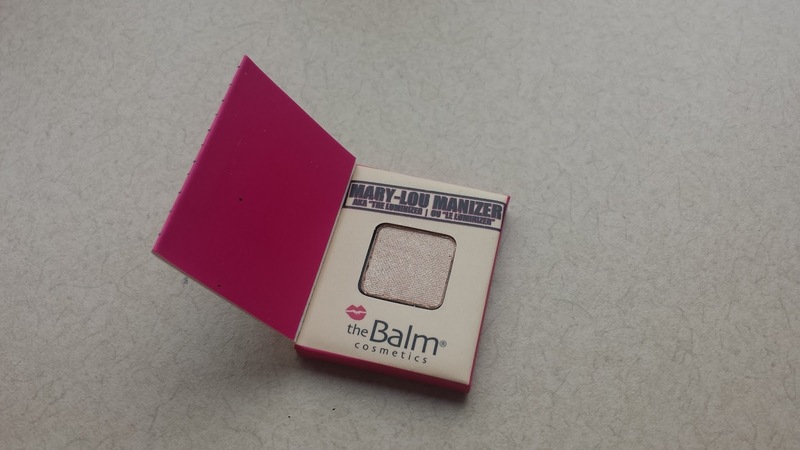 It has a smooth shiny finish with fine shimmers. 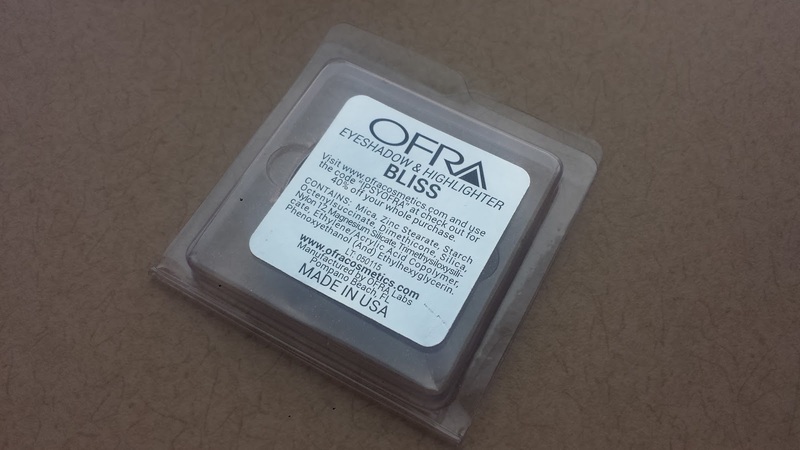 It has great pigmentation and dries fast. 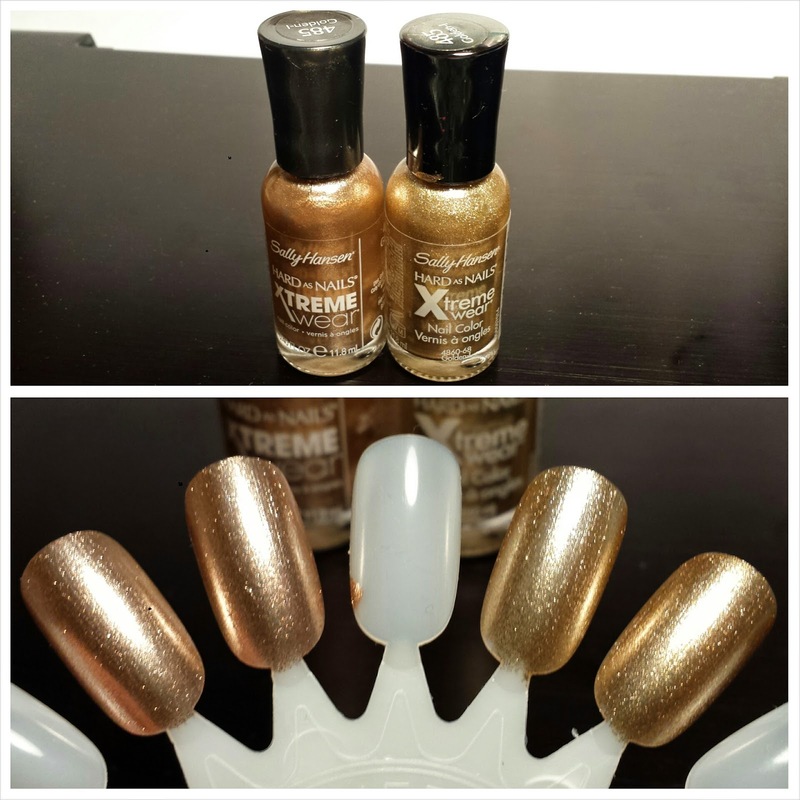 2 thin coats can get you a perfect solid gold finish. The color is a true yellow gold tone. Left: New Golden-I. Right: Old Golden-I. 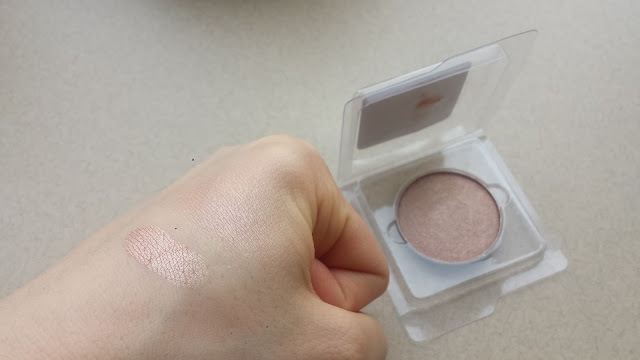 Lately, I found out that the new bottle of the same shade #485 Golden-I has changed its color. I saw it in store and noticed right away, without even needing to compare the 2 side by side! 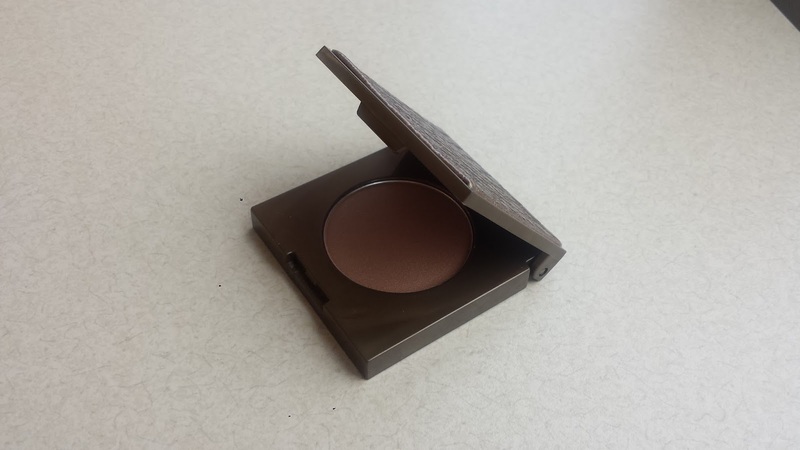 The new version now is more coppery with a warmer brown tone to it. One can even say it's slightly on the rose gold side. I am 100% sure they have changed the color, not saying that I don't like it, but just a bit confused on why would they do that and use the same number and name of the polish? One coat. Left: New Golden-I. Right: Old Golden-I. Two coats. Left: New Golden-I. Right: Old Golden-I. 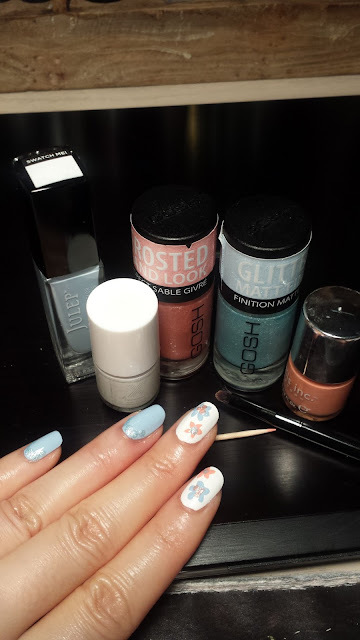 Click HERE for more reviews on polishes! 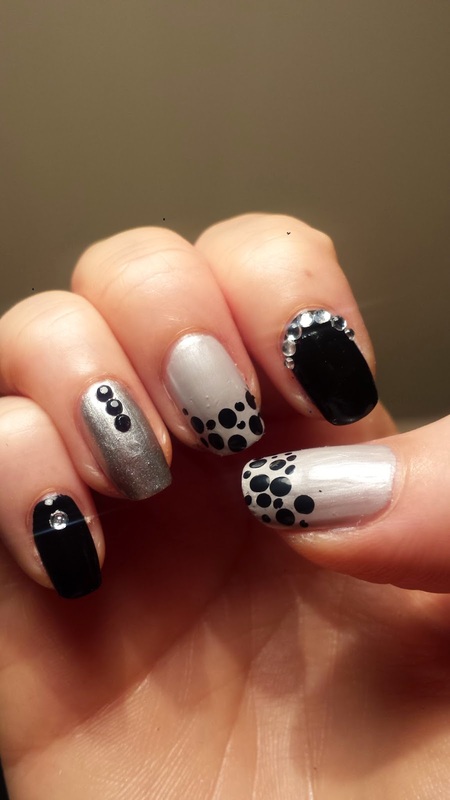 Every girl loves some bling bling! This manicure is perfect for people who doesn't like color or need a break from the colorful polishes. I got lots of compliments for this photo on Instagram! 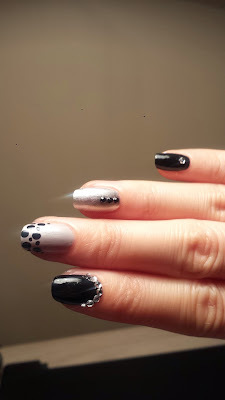 This design is actually quite simple, in fact, maybe I would say "nothing special" if we look at each nail separately. But together, it just gives a nice harmony and modern design! I used a combination of polka dots and jewels design for this cute monotone mani! 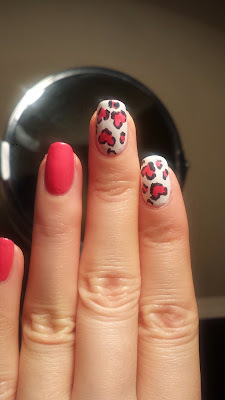 Who says leopard print has to be cool and wild? 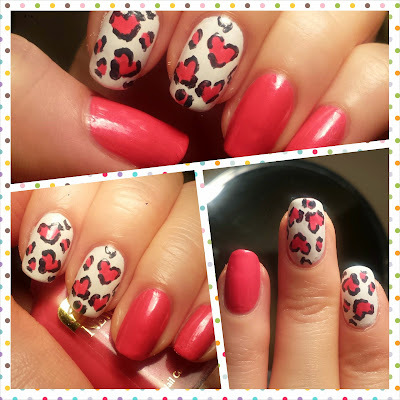 Here I made the spots with pink heart shapes to make a cute style of leopard print ! After the white base is completely dry, I painted the pink hearts on with the brush from the bottle. This does not need to be perfect as we are going to outline the hearts. 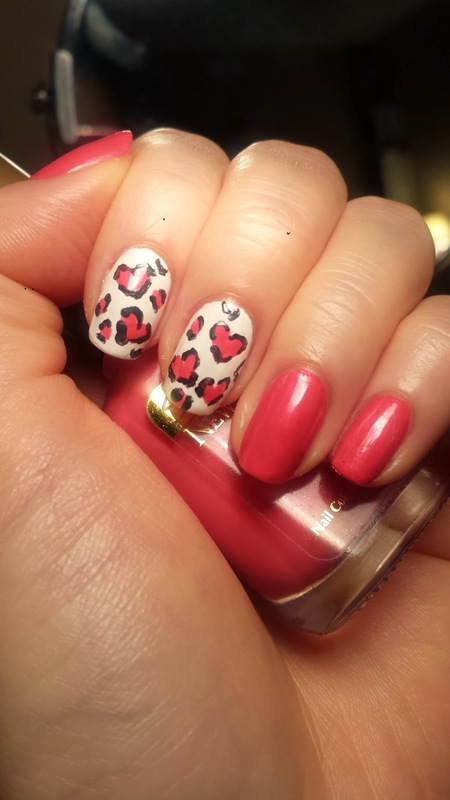 Then I used a dark grey polish and messily outlined the hearts, with breaking lines, resembling the non-uniform leopard print. 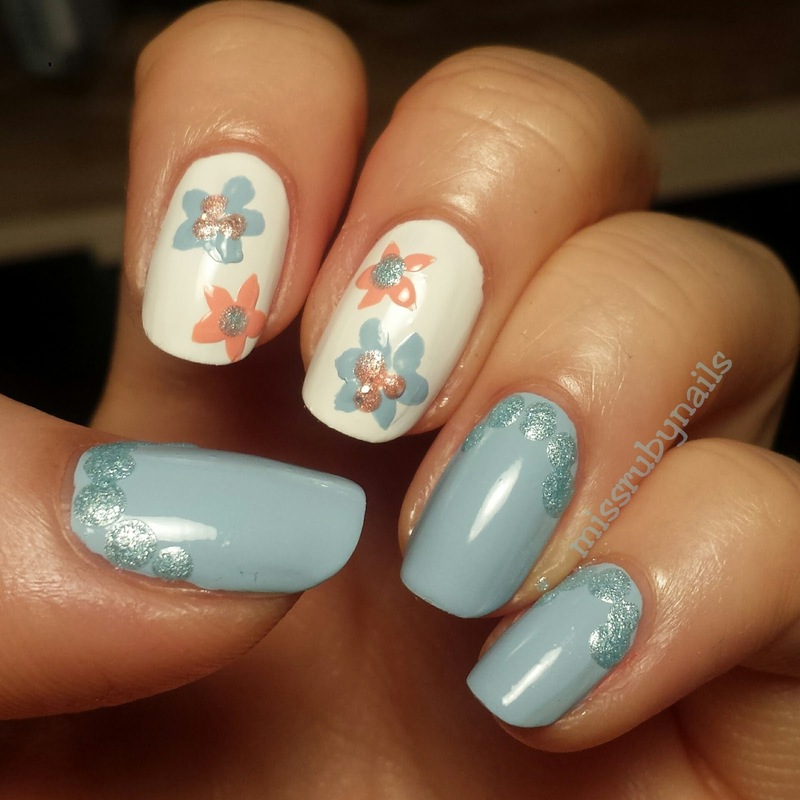 Using a grey color instead of black for the outline provides a softer effect, but it is all personal preference!